Sometimes words comfort, and heal. Not a drug to control anxiety, not any type of mind-numbing alcohol, but words. Speaking words “heart to heart” transmits life. Words bear meaning, are meaning. They cross a physical space (from the speaker’s tongue to the hearer’s ear), and are borne on a physical medium (waves of sound through air), but the essence of all words transcends the physical. Words are metaphysical, they transcend the physical. The essence of words is on the level of meaning. And the level of meaning transcends the level of matter and energy, of time and space. It partakes of another level, mysterious, but real. Words are meaning, not air waves or aspirated grunts or puffs of breath. And meaning is logos, and logos is light, and life, to that part of man which is alive to meaning, which is the essential part. This is what is meant by the phrase “man does not live by bread alone, but by every word…” Because the life of man — the essence of the life of man — is meaning, is logos. Today, citing the words of Christ, and explaining them, the Pope spoke words of meaning, and in so doing, transmitted life. And in so doing, this aging German professor carried out the essential task of his mission. That essential task is to transmit meaning, logos (Christ, the logos incarnate) and so to give life to men beyond the life which bread alone can give. Benedict first spoke the words of Christ, as the Gospels have handed them down to us, and then he explained those words, as if were, making the meaning of the words shine forth even more meaningfully, adding logos to logos by means of logos. All of us know in some measure the sorrow and alienation which marks the life of fallen man — our life — and which in our own time, our present age, has reached new heights, because we moderns are alienated even from our own alienation. And so all of us long for, and can benefit from, a word of healing. And such a word of healing was spoken today. 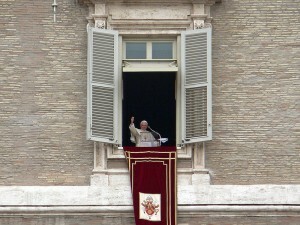 It came at noon, when Pope Benedict XVI appeared at the window of his apartment above St. Peter’s Square for the noon Angelus prayer with hundreds gathered in the piazza below. Before reciting the prayer, the Pope reflected briefly on today’s Gospel, from Matthew, where Jesus says: “Come to me, all who are weary and heavy laden, and I will give you rest. Take my yoke upon you, and learn from me, who am meek and humble of heart, and you will find rest for your life. For my yoke is sweet, and my burden is light.” (In Italian: “Venite a me, voi tutti che siete stanchi e oppressi, e io vi darò ristoro. Prendete il mio giogo sopra di voi e imparate da me, che sono mite e umile di cuore, e troverete ristoro per la vostra vita. Il mio giogo infatti è dolce e il mio peso leggero” (Mt 11: 28-30). The Pope went on: “When Jesus traveled the roads of Galilee proclaiming the Kingdom of God and healing many who were sick, he felt compassion for the crowd, because they were exhausted and helpless, like sheep without a shepherd” (In Italian: “Quando Gesù percorreva le strade della Galilea annunciando il Regno di Dio e guarendo molti malati, sentiva compassione delle folle, perché erano stanche e sfinite, come pecore senza pastore” (cfr Mt 9,35-36). The Pope said many in the world’s poorer nations are crushed down by poverty, but also many in the richer nations are dissatisfied, and even sick with depression. And then the Pope explained what it was that Jesus offers to all those who come unto him: a yoke. “Jesus promises to give ‘rest’ to all, but he sets a condition,” the Pope said. What is this “yoke” which instead of weighing down even more lightens the load people must carry? And then Benedict explained the meaning. And Benedict concluded with these words: “The true remedy for the wounds of humanity, both the material ones, like hunger and injustices, and the psychological and moral ones caused by a false well-being, is a rule of life based on fraternal love, which has its source in the love of God. “For this reason, we must abandon the way of arrogance, of violence used to procure for ourselves positions of ever greater power, to assure ourselves of success at any cost. This is the message of the Pope today, then, to all who are weary and broken-hearted: go to Christ, learn from him, and take on his “easy” yoke: the yoke of humility, the yoke of love, and you will find rest.